I drove east Saturday morning, saw a patch of rainbow within the clouds and sunrise. A golden ring encircled the colors and blinding light. Within seconds, this atmospheric phenomenon evaporated. Ah, to be in the right place at the right time is a marvelous gift of grace. Our fellow novelists said “no” with a question on their brows. So, that’s what I saw and didn’t know it. “Do you mean the bright rainbow?” I asked. Yes, that’s what he meant and offered an explanation about “dog-ears”, which explained the formation of two symmetrical rainbows to the left and right of the sun. The Greek philosopher Aristotle mentioned “two mock suns” long before legend said the two rainbows were named sundogs because they follow the sun like a dog follows its master. Dear Reader, don’t you love connections between science and our beloved canines? Technically, sundogs are “bright spots in the sky caused by the refraction of sunlight off tiny ice crystals in the atmosphere.” Authors like Stephen King wrote about the phenomenon in his short story “Sun Dog”, and Shakespeare mentioned “three suns” in "King Henry VI, Part 3". I’m fond of bright spots, be they scientific or artistic, particularly human, like Tom. If he hadn’t asked about sundogs, I may never have known what I saw in the sky Saturday morning. Think about it. Much of what we learn comes by these random, unexpected encounters that enlighten our mind and soul. They lift us to the heavens; secure us to earth and each other. Such is the case with a painting I saw in the Milwaukee Art Museum the day after Christmas. Our family gathered within what resembles the ribs of the Great White Whale beached on the shore of Lake Michigan. 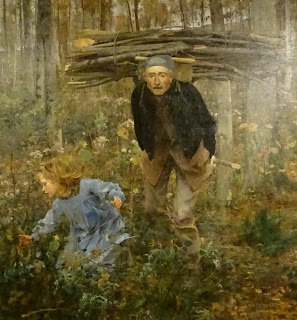 We followed a docent for a guided tour she concluded in a gallery where a large painting of an old woodsman and a little girl drew me to her luminous blue smock. As most excellent art, it has an ambiance of story, one blended with the suggestion of the Impressionists and the precise technique of the Academicians. 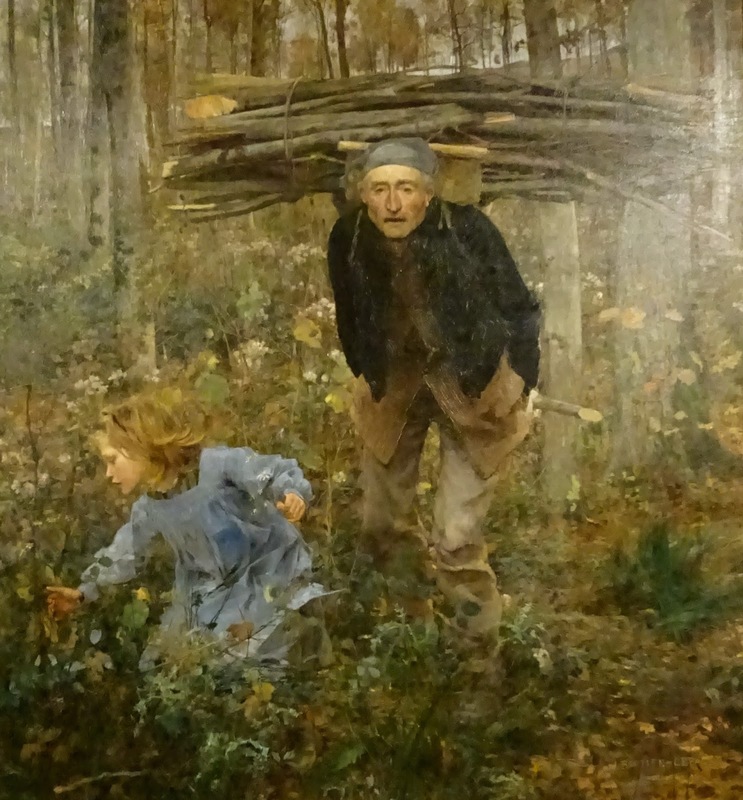 Bent with a load of kindling on his back, the old man looked into my eyes with his mouth parted, unspoken relief on his lips, for he has found his granddaughter who strayed into the woods picking wildflowers. I know his story for I was the wandering child. Now I am the grandparent. I gather and carry the cares of my children and grandchild. This I will do through the passage of time, buoyed by sundogs and bright spots.